DSST is actually a lot shorter and easier to say. DSST tests are tests that you take to earn college credit. You choose the subject you are interested in, study, take the test and you're THREE COLLEGE CREDITS along on your degree. They are similar to CLEP tests, cost $80 to take (plus the test center fee), and go on your college transcript as soon as you click "completed" on your test on the computer. It's just that easy to get college credit with DSST tests. And better yet, we guarantee that you'll pass the test! More questions? See our New Student Center or send us an email. We've had a lot of questions from parents that homeschool their kids, particularly their teenagers, about CLEP and CLEP testing. This will be the first of several articles that we will publish about how you can work CLEP into your days and lesson plans. For the full homeschooling article, it can be found on the main website. As always, send us your questions and we will make sure you get the answers that you need to help make the best CLEP education decisions for you. How many hours of credit are your awarded for CLEP? How many hours of college credit do you get for a CLEP test? Good question. :) It depends on the test. Most tests will give you three credit hours - most will give you between 3-6. **On foreign language tests, you can get more credit if you get a higher score. These are the ACE recommended scores to get 12 credit hours. How can you CLEP college when you're over 50 years old? You actually have a great start by your experience in working and living life in general. You have a lot of work experience that will help you know a lot of the answers already. You should be able to test out of as many as 30 credits towards your degree at most schools but that won't be an entire degree. Few schools will allow you to test out of an entire degree, and be skeptical of those that do. This is a way to get college done faster and cheaper. Check with your school, or the school to intend to go to and see what their policies are regarding CLEP testing. You can also check out our New Student Center for step-by-step information and guidance. How long does it take to get CLEP credit after taking the test? Well, technically you get it instantly. However, if you need the credit for graduation, then you'll need to review your deadlines for transferring credit at your university. Most schools will request your official CLEP transcript to add the credits to your "account" at the school - possibly as early as eight weeks before graduation. If you are needing a few more credits before graduation but you want to "walk" with your class your school may have a policy that will let you walk if you need as few as nine credits (like University of Phoenix). Which CLEP test is the easiest to pass? Of course, you've heard that it depends on each student, their strengths, their experience, and their interests. While that's all true - it doesn't really help you with deciding which one to take does it? We recommend taking the Analyzing and Interpreting Literature CLEP test first - assuming that the credit will apply to your degree program. It is one of the easiest tests because there is not a lot of memorization. Those tests can be difficult because there can be a LOT to memorize. The Analyzing and Interpreting Literature CLEP test however doesn't have a lot of memorization. You need to learn a few important terms and concepts, but the majority of the test has you analyzing literature - just like the name implies. We don't recommend this test as the easiest for people who do have have English as their first or native language. But - assuming you're a native English speaker and you know how to read, with some effort, you can knock out your first three credits relatively fast and easy. We're happy to answer more specific questions if you send them our way. So you want to know how long it takes before your credit card is charged? When you take a CLEP test online, it is charged (authorized) immediately. That means that the funds are taken from your account after you enter your credit card information and press submit at the beginning of the test. And yes, you HAVE to use a credit or debit card to pay for the test. You'll also need to pay the CLEP testing center separately if they have a fee - and most do. You can make sure you are totally prepared for your test by studying with the best CLEP resource possible - our CLEP test study guides. We offer a specific guide for every test so you only take time studying what you NEED to know to pass your CLEP test. How many questions do I need to get right to pass my DSST test? I have been preparing and studying for two exams. 1) Civil War and Reconstruction 2) Rise and Fall of the Soviet Union. I understand what the score is that I need in order to pass but my question is how many questions do I need to get right? For example, the Civil War exam has 116 questions and I would like to know how many I need to get right out 116. Same with the Soviet Union, out of 100 questions how many do I need to get right in order to pass with a score of 45? The quick answer is about 50%, slightly less on Civil War. Doesn't seem like much does it? However, when you prepare for the test, try to go for 100% correct. That gives you quite a buffer ensuring that you will pass. We also recommend that you only study for ONE test at a time. This keeps you focused on one subject and gives you a better advantage in passing. 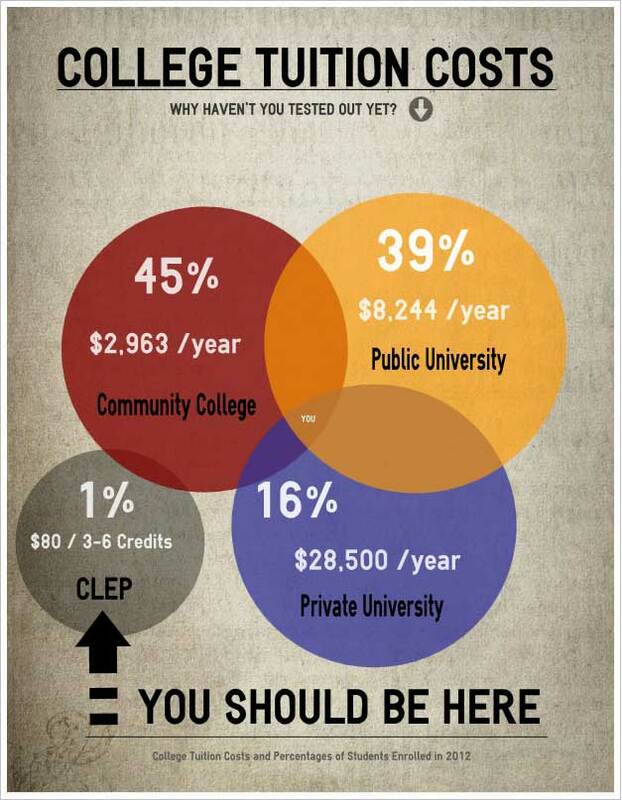 Here's a great CLEP Infographic to check out. See how much money you could be saving by testing out. Well, it is pretty easy. More questions? We're happy to answer them!